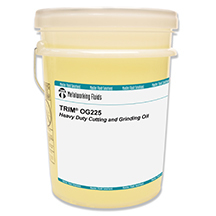 TRIM® OG225 is a medium to heavy-duty straight oil designed for use in grinding operations of hardened steel alloys, tool steels, stainless steels, inconels and titanium. A carefully selected extreme pressure/anti-wear package together with great detergency ensures TRIM OG225 provides very high stock removal rates in flute grinding without burning. It is also formulated to comply with aerospace regulations, i.e. no chlorine and no active sulphur additives. TRIM OG225 can also be used to machine all materials, including yellow metals, in high pressure applications where low oil mist is advantageous.